In olden days mainly in India many residents provide or construct one pooja room known as God Room, Temple, Mandhir, Bhajana room, Prayer room etc; days and years are passing, now the pooja room converted into pooja shelf, now a day’s people placing God Idols at shelves only, not involved to construct one separate room to God, our interesting god, why this development happens, because of time, now many people does not have time to clean the room, or no place to provide pooja room or not interested to do pooja. Which room is the correct place for deity, we shall discuss all the important things here about our beloved Deity, God. 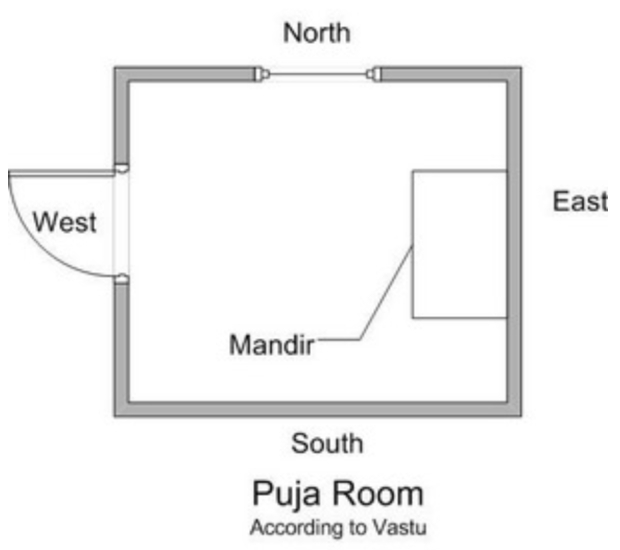 As per Vastu shastra Northeast corner is the right and correct place for the pooja room. But according to the latest logical study we found that this place (north east) should be very clean and we should not construct or put anything at this place. In our researches we found that the placement of pooja room at northeast corner is one way its right and another way it’s wrong, why because, our elders are very intelligent and well wishers to the coming generations, in taking importance of next or future generations they implemented this system of pooja room at Ishan (Northeast) corner and saying these rules as Vaasthu principles. Why the elders have done like this, there is a great reason behind it. Actually as per the vastu shastra Ishan corner walk is very good and most developed cause for human beings, in taking view of this they implied this rule as pooja room should be at Ishan corner, and also another two reasons are invented that, Ishan place should always be clean, and Ishan place should always be less weight, in taking consideration of all these factors they implemented this rule as pooja room should be at Ishan corner. Thanks to our elders, well wishers. 1. Pooja room should always be clean and no other things except pooja materials should be kept there. 2. Pooja should not be placed at the Southwest corner of the house. 3. Pooja should not be placed at Ishan (Northeast) corner of the house.But here with some provisions we can put or install or construct the pooja room at Ishan corner with care, before going to do it, better to get suggestion from one experienced vastu consultant. 4. In pooja room Gods are to be seated at East facing and spatient has to sit and worship God by seeing the towards West side. 5. Pooja room can be constructed at Agneya (Southeast) corner, with some conditions. 6. Pooja room can be planned at Vayavya (Northwest) corner, with some vaastu terms. 7. At any cost pooja room should not be placed at outside of the house, if so with some specifications we can do it, but be careful. 8. Four side walk is fortunate for pooja room, try it, but only with stern specifications. Consult for good experienced vasthu expert. 9. Free air should be passed in pooja room and should not be totally closed, or air tightened.